Historical Atlas of Ancient AmericaWhen Christopher Columbus landed on the Caribbean islands, he found tribes of people still firmly rooted in the Stone Age. Within decades, however, Spanish explorers made contact with cultures in the Mesoamerican isthmus which lay beyond the Caribbean that possessed far greater technological prowess. 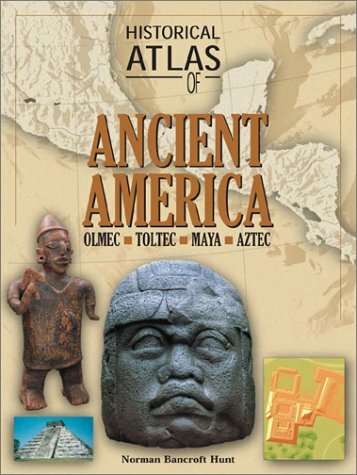 "The Historical Atlas of Ancient America" describes in vivid detail the highly developed religious, political, economic, and agricultural systems of the wealthy and highly influential Aztec and Maya civilizations, along with those of their predecessors, the Olmec and Toltec. The key features of this title include: superb full-color photographs of temples, towns, and artifacts; timelines that compare developments in Mesoamerica to those in the rest of the world; and, specially created maps that highlight the movements and influences of the Mesoamerican people and identify their major social and cultural centers. This book was a joy to read, a great addition to my ancient culture and metaphysical library. I read it just before going to southern Mexico for 2 weeks, it was the perfect Mesoamerica primer for me. Beautiful book!Comment: For most people, this is a great introduction to the field. It breaks down every aspect of Mesoamerican cultures into two-page spreads of easily digestible info. Two pages per topic is just enough to satisfy but not overwhelm a reader. If someone did a study on breaking a large subject into bite-size chunks to increase readability, this book would be Exhibit A on how to do it. My only complaint is with the final few pages on Aztec mythology. It's a bit too much on the subject. Why devote so many pages to the Aztec gods but not the Maya gods? It was almost as if Hunt was trying to fill his page quota. Or as if he were an expert on Aztec mythology and wanted to show off his knowledge. But that's a minor quibble. This book is a perfect starting place for those interested in the Maya, Aztec, and other Mesoamerican peoples. Rob's rating: 8.5 of 10.